I knew right away that I wanted to use my new Lawn Fawn Baked With Love stamp set and dies. I just think all of the elements of this set are so cute! I am still working hard on my Copic colouring getting away from always feeling the need to flll the entire image with marker, learning to leave some white space inside the image. Something I started to learn about during Kelly Rasoosin's 30 Day Coloring Challenge. What I find about this technique in Copic colouring is that my images feel more CAS! 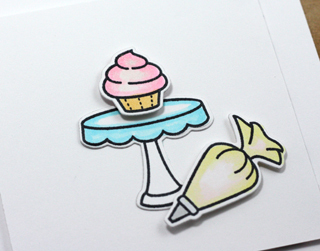 I added a bit of WOS detail to the cupcake too. Love how you colored the images!! It's so sweet in every way, Tracey! Such a "sweet" card, Tracey! Love your beautiful, soft coloring! Very pretty colours and beautiful layering. That stamp set is perfect for this challenge. Your colouring really makes this really CAS. Great work! Your coloring is gorgeous! I really see what you mean about leaving the white space. I love that darling LF set, and your card is wonderful! I love these images.. this card is the cutest..
Beautiful Copic coloring, and I love your CAS design! Really cute card, Tracey! Soo very sweet! Love you CAS design and you perfectly colored those images!! Yum! Love this! The added touch of shimmer is perfect! Awesome coloring, too! Cute card, Tracey! Love the touch of glitter on my cupcake. Awww, this is perfectly sweet Tracey! How cute is that little piping bag!! 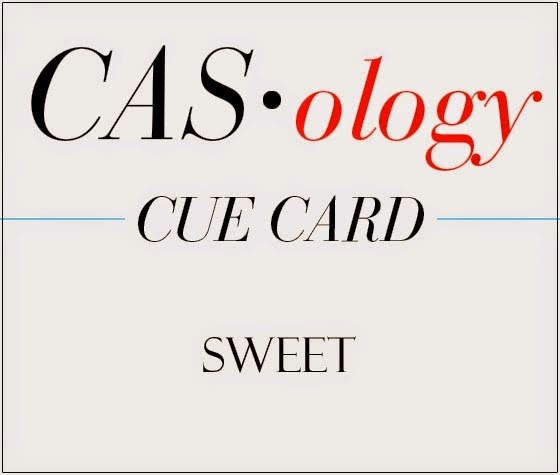 Fabulous interpretation of the cue word! Love the soft coloring! Adorable Tracey! Your coloring is gorgeous. What a sweet card! Love the soft coloring and the bit of sparkle is perfect! Great coloring, Tracey! Love this! 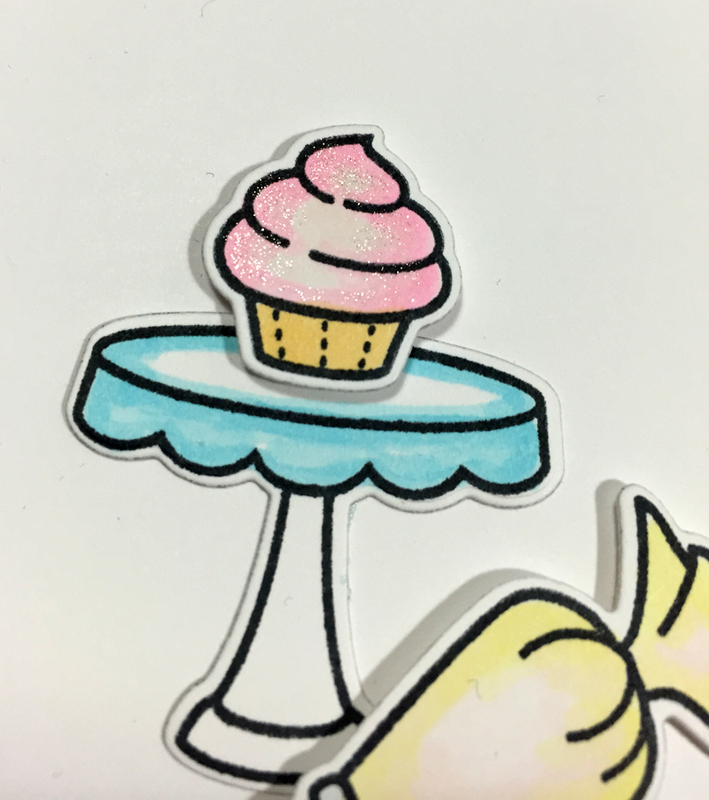 I want this stamp set so bad, and your coloring is perfectly delish! The Wink of Stella finishes things off brilliantly! Love your coloring on this, Tracey. Oh, this is so very sweet. And, your coloring is amazing. I love how you left a bit of white, and I always wonder how one knows what bits to color, and what to leave white. Maybe you will share your secret with me one lucky day. They really are super cute images and I may have to try that Copic technique. I love the look of your coloring! Echoing the others (who comment on time! ): absolutely A-DOR-A-BLE! Sweetness, plus! Adorably sweet and CAS, Tracey! LOve the sparkle on the cupcake! 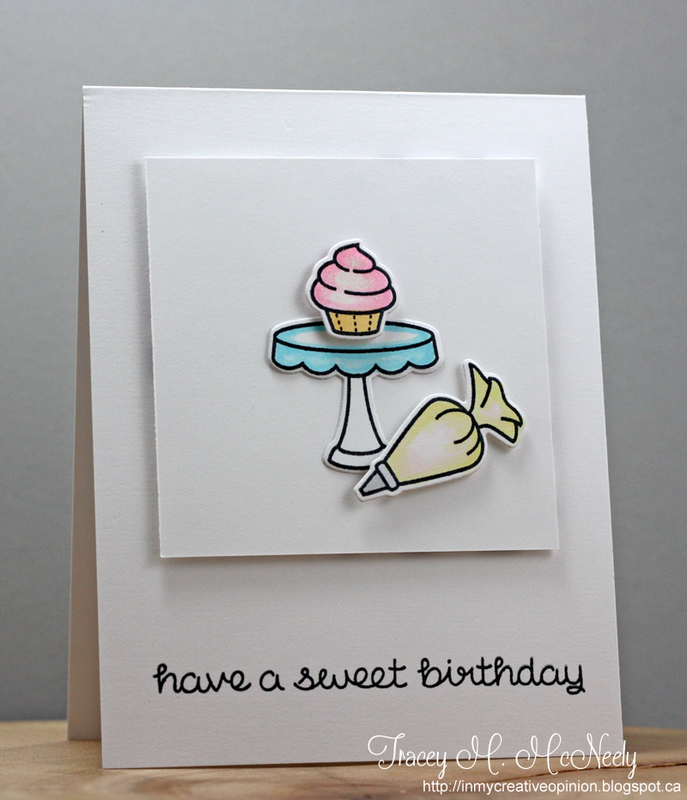 Sweet card...love your yummy looking cupcake and that bag of left over frosting too, just the perfect way to make a card. I love it! Hey Tracey!! You picked the right stamp set for this challenge. I totally forgot I had this set. You did a great job coloring your images. Nicely done. Oh, I love catching up on your news from the week that's been. Your life certainly sounds very busy at the moment. House-hunting too, no less! Anyway, love this card and am a big fan of the partial colouring! WOS detail always a winner too! Sorry to hear about your daughter's recent experience! Poor thing! Never a dull moment!